Looking for advice on who to play in your MMA lineups? In today’s edition of MMA Roosevelt’s Scouting Report, I break down Saturday’s slate for UFC Fight Night live from Brooklyn, New York! 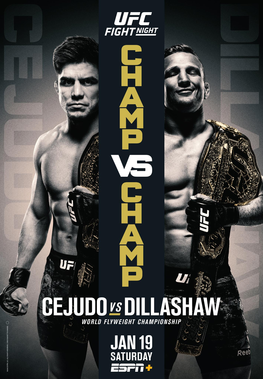 Welcome to my breakdown of UFC ESPN+ 001 card live from Brooklyn, New York! This is the first card under the umbrella of the brand new billion-dollar partnership between UFC and ESPN! Last year was a really bad year for me in MMA. You wouldn’t have thought it would be considering how accurate many of my MMA articles are. However, one thing you have to remember when it comes to fantasy sports. You can accurately predict the result of a sporting event. However, you still have to build winning lineups. Hopefully, 2019 will be better in that regard! You gotta like building around the winner of the only 5 round fight on the card, which is what I see Dillashaw doing. He clearly has a significant striking volume advantage and I don’t see Cejudo getting enough takedowns to make up for it. Gillespie has the DraftKings fight logs and the highest fantasy point scoring path to victory out of all the 9k+ fighters on the card. Not only does he have finishing capability, he can get enough takedowns to score high even in a decision. Sandhagen, Hardy and Menifield should all win pretty decisively. Their lack of experience in the UFC is what prevents them from elite. Also, in the case of Hardy and Menifield, their upside is basically 1st round 100 point knockout, which is good, but not necessarily GPP winning at their price points. In a card with not a lot to like in the underdog department, I actually like Cerrone and Bermudez’s chances of winning these fights. While I don’t see Cejudo winning, he is a live dog and he’s super cheap in a fight that has a really strong chance of going the distance. I think you have to play him in cash. I think the Main Event is stackable in cash and I don’t mind him alone in GPP in case I’m wrong because he does have a chance to win this fight. I have the fair plays listed in order of how I like them for fantasy purposes. Muhammad, I’m predicting to get the upset. However, definitely not hugely confident in that pick, which is why he’s down here in the fair zone. VanZant, Lipski, Benavidez and Teixeira should win. I’m concerned about whether they will hit value as well as other fighters who I’ve ranked higher. Chance Rencountre is trash but so is his opponent. So if I have to pick between two trash fighters, I’m taking the cheaper one. Hernandez, I’m predicting will lose to Cerrone but he can obviously win here so don’t mind some shares in case I’m wrong. Roberson, Edwards, Neal, Stewart and Ortiz, I’m predicting will lose. However, they have enough of a chance to win to make them worth considering as a final piece or as someone to differentiate your lineups. Ostovich and Calderwood have chances of winning. However, I don’t like their chances of scoring well even if they do win so I won’t have any shares. Moreira, Bautista, Medeiros and Crowder, I don’t like their chances of winning at all so I won’t have any shares.